The spectacular Noyo Headlands Park has opened its coastline in Fort Bragg, California. You may now occupy land that has been inaccessible to the public for over 100 years. It’s a magnificent way to see the rugged, wild coast, its many habitats, inhabitants and thought-provoking historical sites. Within the park, the Fort Bragg Coastal Trail is an 8’ wide, hard top path meandering along the coastline. The trail supports walking and rolling for all ages and abilities. Interpretive panels highlighting nature and history are scattered along the way. Benches offer a scenic respite and unparalleled whale watching when the breath taking giants happen to be passing. Take binoculars to get a good look at birds, mammals, whales spouting and breaching or the comic antics of Pacific Harbor Seals lounging in groups on rocks just off shore. Nature puts on a constant show of waves and wildlife. It’s never a repeat performance. Conditions change from hour to hour. High tides conceal beaches that were just visible. Sub tides reveal areas usually covered by water. Creatures flourish in the ocean, tide pools, beaches, headlands and air. Native plant life restoration provides shelter and food for Mother Nature’s lodgers. There are many historic and cultural sites in the park. A popular area is Glass Beach, the site of the former city dump. The trail is bounded on the east by the Georgia Pacific mill site. Fort Bragg was a mill town from 1869 to 2002. This video will give you an idea of what the mill and lumber industry looked like. Georgia Pacific closed the mill in 2002. Most of the mill buildings have been removed. One time mill ponds are now habitat for birds, mammals, amphibians and fish. Deer, fox, rabbits, raccoons, skunks, ground squirrels, gophers, moles, voles, mice and many other mammals have returned and are thriving. Ninety different bird species are a bird watcher’s delight. Sea and shore birds are joined by migrating geese stopping over for rest, food and water. 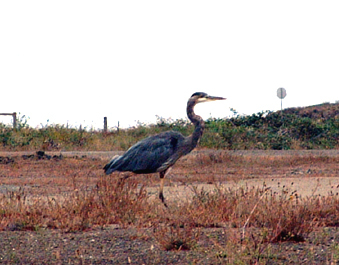 Cranes, osprey and other hawks hunt for small mammals, fish and amphibians. Song birds, finches, larks, sparrows, thrushes and more feast on flowers and seeds in the prairie-like grasslands bordering the headlands. My favorite bird, the raven, prospers here. A large stand of cypress trees just east of the park is a long established roost and nesting site. 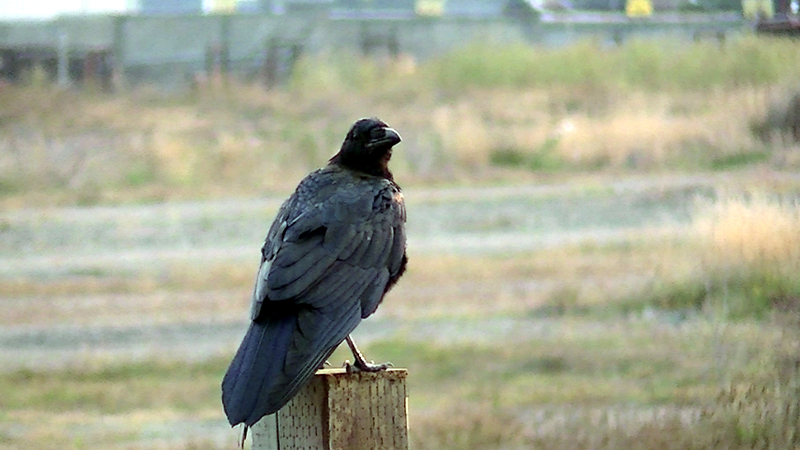 Ravens are known as nature’s pranksters. They often use the last remaining ocean-side lumber yard’s stacks of boards as training and feeding grounds for their young. Watching a raven’s flying lesson is heartwarming and a laugh a minute. During nesting season raucous sky battles breakout between ravens and small birds. The ravens are notorious nest burglars. They squawk, chirp, soar and dive. The ravens always win and definitely enjoy leading the angry birds on a vigorous aerial chase. As of August 2015, Phase II of the trail and park is under construction. When work is completed, an additional trailhead, paths, entrance, parking lot and restroom will open. Open from sunrise to sunset, there is no admission fee. From North Main Street turn west on Elm. The entrance is 2 blocks ahead. Quiet, well-behaved dogs are welcome on short leashes. Staying on designated paths and stairs is critical to the reintroduction of native plant life, wildlife and to your safety. Restrooms and drinking water are available in the parking lot at the park entrance. Occupy Nature and walk or roll in one of the most scenic parks and trails you will experience. It truly embodies the nature and history of this remarkable coastal community. Click to read the print story appearing in the September 1, 2015 issue of Fort Bragg-Mendocino Coast Packet.